The news that Senate will investigate how Aquino, Trillanes and Del Rosario lost the Panatag or Scarborough to China – is really something to be grateful about. Former envoy and veteran columnist, Rigoberto Tiglao said that Senator Loren Legarda, chairman of the Senate’s committee on foreign relations has welcomed a probe into how the country have handled its territorial dispute with China in the South China Sea. Tiglao, said that investigating would only not help the Philippines learn the important lessons but also to reveal the truth to the nation. “We lost Panatag also partly because of Aquino and del Rosario’s colossal error of trusting the US too much, as the following account will show.” He said. The former diplomat also cited how Trillanes put the blame to de Rosario, whom he reportedly accused of treason in a previous interview with GMA News about the Panatag incident. “he claimed was part of the foreign secretary’s strategy to create a rift between China and the Philippines. 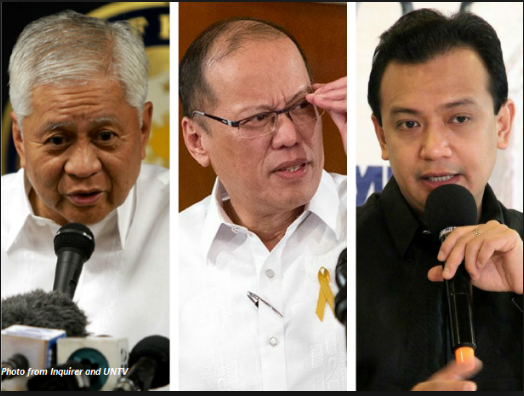 Trillanes also claimed that in the end, Aquino had blamed del Rosario for the fiasco.” Tiglao wrote. The columnist explained the alleged mistakes of Aquino that triggered the loss of Panatag to the Chinese. Aquino broke the “peaceful coexistence” of sorts in April 2012. April 10, 2012: Sailors from a Philippine Navy surveillance ship board eight Chinese fishing vessels anchored in the shoal’s lagoon. They try to arrest the Chinese fishermen allegedly for illegal fishing. However, two vessels from the China Maritime Surveillance (CMS) come to the rescue of the Chinese and prevent the arrests in circumstances that are unclear. Aquino immediately orders the Navy’s biggest warship BRP Gregorio del Pilar (a refurbished cutter from the US Coast Guard) to confront the Chinese at Panatag Shoal. “What is important is we take care of our sovereignty. We cannot give [Panatag] away and we cannot depend on others but ourselves,” Aquino blustered. From here, the author concluded that Aquino’s move to send a “warship” (handed by US Coast Guard) have made Beijing claim that Philippines had militarized the dispute, prompting them to retaliate by sending boats and occupy the shoal. “BRP Gregorio del Pilar left, Aquino could deploy only one vessel of our Bureau of Fisheries and Aquatic Resources (BFAR) and two Coast Guard vessels to remain near the entrance to the shoal’s lagoon.” Tiglao explained. If recalled, a stand-off followed between China and Philippines which lasted for about a month and a half. Then Aquino appointed Trillanes as his secret envoy to resolve which only resulted to more confusion – says Tiglao. April 12 to June 3: The Chinese CMS vessels and 90 fishing boats occupy the lagoon, while about seven Philippine BFAR and Coast guard vessels position themselves just outside the entrance to it in a stand-off. June 4: “PNoy called me to inform me that our two BFAR vessels already left the shoal but China reneged on the agreement of simultaneous withdrawal of their ships, so two of them [were]still inside the shoal,” Trillanes wrote. June 10: Aquino orders the remaining two Coast Guard vessels to leave the area. The Chinese didn’t. Since then, the Chinese have not left the area, and that concludes how the country lost Panatag shoal to China. Since that incident, no Filipino ship or any fishing vessel has been able to enter the Panatag that is now occupied by Chinese. And that “Chinese strategists must have rolling on the ground laughing at Aquino.” Tiglao said.